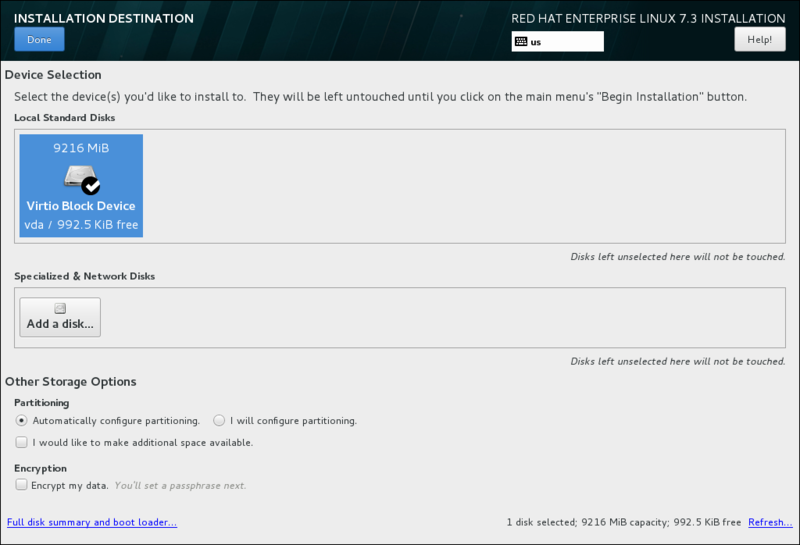 This section describes the simple procedure to install and register Red Hat Enterprise Linux after you have created and booted from an installation USB drive. Chapter 7, Booting the Installation on 64-bit AMD, Intel, and ARM systems. 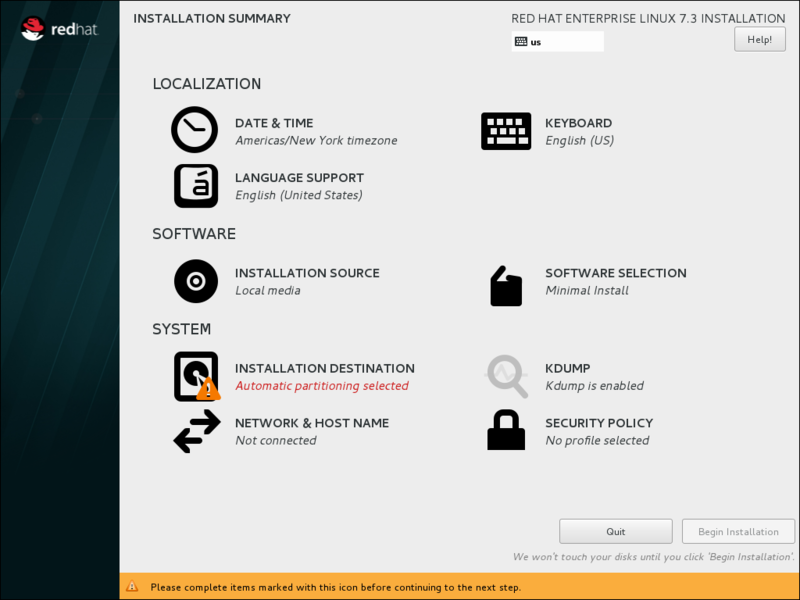 Select Install Red Hat Enterprise Linux in the boot menu and press Enter. 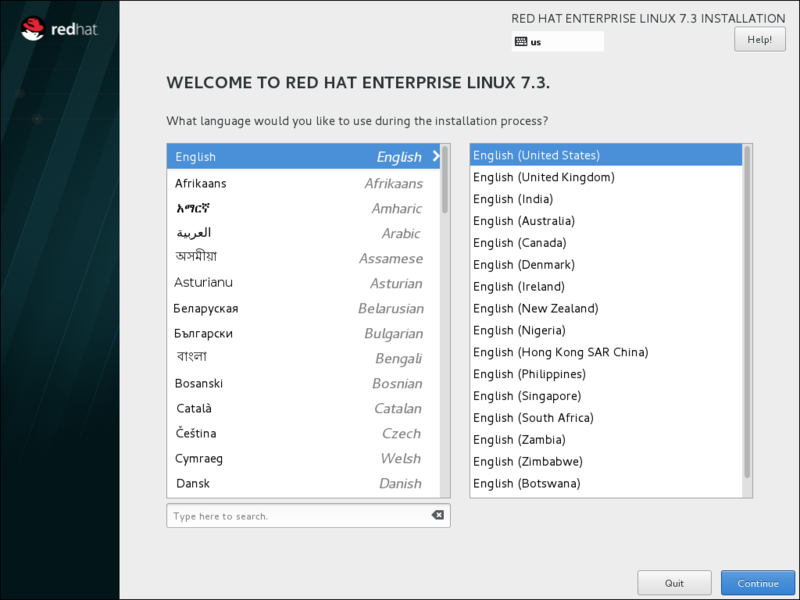 After Anaconda, the Red Hat Enterprise Linux installer, started, select your language and region, and click Continue. You can display and modify the individual options in any order. If a configuration option was automatically configured correctly, no further action is required. However, if items are marked with an exclamation point icon, you must complete the configuration for these items before you can begin the installation. Nothing will be written to the disk until you click the Begin Installation button. Set your region and the nearest city in your time zone. Click Done to return to the Installation Summary. Use the + and - buttons to add and remove keyboard layouts. If you enable multiple keyboard layouts, move your preferred layout to the top of the list using the ↑ button to set it as default. Select the target disk. A check mark is displayed next to the selected target. The selected disk is partitioned automatically. Click the Ethernet sliding switch in the top right corner to enable the network configuration. Optional, select the device and click Configure to update the network interface configuration. Anaconda applies the network settings immediately. They are used during the setup and after the installation. 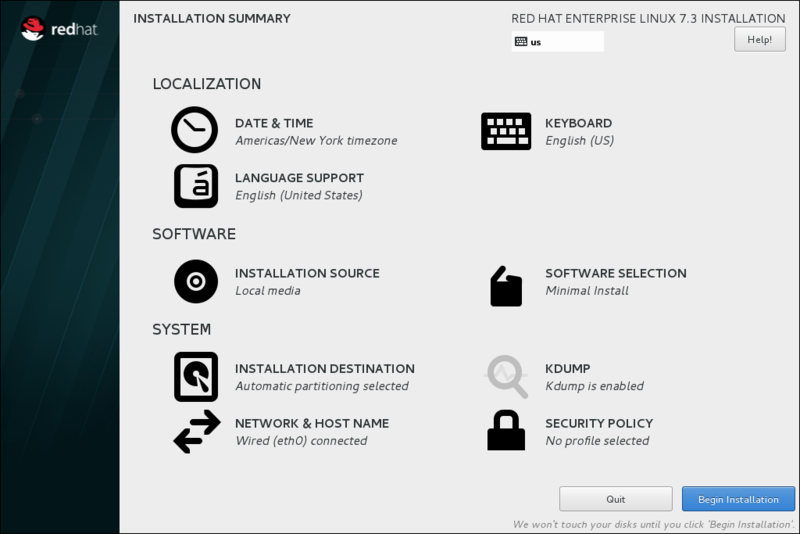 On the Installation Summary screen, click Begin Installation. Enter the password for the root user and confirm it. Click Done to return to the Configuration screen. Enter the user's full name. Optionally, update the automatically generated user name. Set the password and confirm it. Optionally, check the Make this user administrator check box. This will add the user to the wheel group and allow this account to use sudo without any further configuration. Wait until the installation completes and click Reboot. For details, see Chapter 30, Initial Setup.